"Adorable Penguins Put the “Awww” in Awesome"
PENGUINS is a delightful Disneynature documentary about an Adelie penguin named Steve and his year of finding love and family on the icy continent of Antarctica. 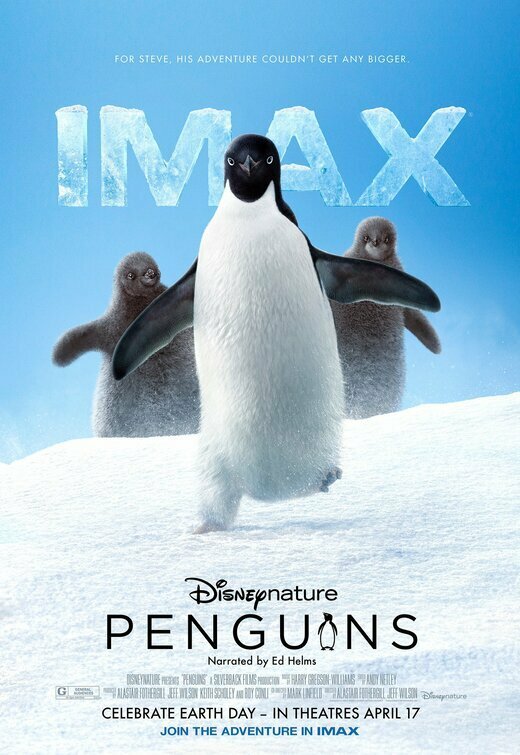 PENGUINS is full of love, humor and jeopardy, with a positive theme of family that runs throughout the movie. There’s only a light caution because of some violence between penguins and their natural predatory enemies in God’s animal kingdom. PENGUINS is a delightful DisneyNature documentary about an Adelie penguin named Steve and his year of finding love and family on the icy continent of Antarctica. While the extremely successful documentary MARCH OF THE PENGUINS followed a group of Emperor Penguins, this documentary focuses on the much smaller, and often funny looking, Adelie penguins, which are only about two feet tall. Each year, the male penguins go ahead of the females to find exposed ground so they can prepare nests for the females. The main character of this story is Steve, who’s a bit behind and not as put together as the other Adelie penguins. Actor Ed Helms serves as the narrator, but he also comically becomes a voice for Steve the penguin. Even though Steve is way behind schedule, he finds a spot for a nest. When females finally arrive, he’s approached by Adélaïde, and, like any great love story, it’s love at first site. The penguins start having eggs, including Steve and Adélaïde, but the harsh elements of Antarctica prove to be a continual danger, including terrible blizzards and birds that try to steal the penguin eggs to eat. Steve also has to make many treks to the water to fill up on food. As their baby chicks hatch and grow, they hurry to feed them so they can get strong and make it out to the open ocean before the shores freeze, and they’re cut off from their source of food. Will they make it? PENGUINS isn’t merely a nature documentary, it’s a story with love, humor and jeopardy. The movie focuses on entertaining audiences more than educating them. The filmmakers smartly give Ed Helms room to bring the penguin character Steve to life, more so than previous Disneynature movies. Many moments are genuinely hilarious, and other moments are filled with great tension as the penguins have to survive villains like the sea lions. The climax will have you holding your breath. Topping everything off, the cinematography is gorgeous, and the music is lighthearted and infectiously joyful. PENGUINS is told in a way that celebrates monogamous relationships and family, with a father stepping up in his role to protect his chicks. While there are no overt references to God, the miraculous way these creatures were designed to survive, mate and migrate is truly remarkable. Thankfully, there’s absolutely no proselytizing for environmentalism, climate change or humanist evolutionary theory in PENGUINS. A light caution is advised for some danger that the penguins face from the birds and the sea lions. Ed Helms also makes several jokes about natural barfing, because the penguins feed their chicks by regurgitating food into their mouths. God’s Creation truly is remarkable, which is why many nature documentaries lead with awe-inspiring visuals. PENGUINS is less awe-inspiring and more “aww” inducing. It encourages viewers to feel the love, joy and humor of these loveable, adorable animals. Everyone can waddle out of this movie happy. One penguin steals stones from its neighbor. PENGUINS is a delightful Disneynature documentary about an Adelie penguin named Steve and his year of finding love and family on the icy continent of Antarctica. Actor Ed Helms serves as the narrator, but he also comically becomes a voice for Steve the penguin. Each year, the male penguins go ahead of the females to find exposed ground so they can prepare nests for the females. Steve is a bit behind the other penguins. Will he prepare a nest in time to start a family? PENGUINS isn’t merely a nature documentary, it’s a story filled with love, humor and jeopardy. The movie focuses on entertaining audiences more than educating them. Many moments are genuinely hilarious, and other moments are filled with great tension as the penguins have to survive villains like the sea lions. The story is told in a way that celebrates monogamous relationships and family, with a father stepping up to protect his children. Thankfully, there’s absolutely no political proselytizing in PENGUINS. A light caution is advised for some danger the penguins face from other birds and from sea lions.